Early morning, pre-dawn, scores of lorries arrive at Nairobi’s Wakulima and other markets bursting with fruit and vegetables from the villages. Loaders and hand-cart pushers swing instantly into action, off-loading, weighing and transporting the agricultural produce to various destinations around the city. The business of the day closes before the sun rises. To an outsider, this all appears fast, furious and no-doubt lucrative. Yet this is a fallacy. The brokers are the kingpins who call the shots, while the farmers pocket peanuts for months’ of sweat. And so the kingpins jumbo-jet to various entertainment joints around the capital, the farmers limp back home to await another long season. Now fortunately, the farmers have another outlet for their wares via SokoShambani, a Kenyan startup aimed at helping connect rural producers with their marketplace. “SokoShambani is a market-based micro-logistics platform that enables small-scale farmers to trade directly with high value market entities,” explains Stephen Kimiri, the CEO and developer. Farmers subscribe to a free SMS service on the 8988 short-code powered by Twitter and @ViaziSouthRift. “Through this, they are able to trade directly while sharing farming intelligence, market reports and updates,” explains Kimiri. The startup has singled out potato farmers in rural Kenya after noting that potato is a staple food second only to maize in Kenya and that farmers are usually given a raw deal for their produce in the markets. 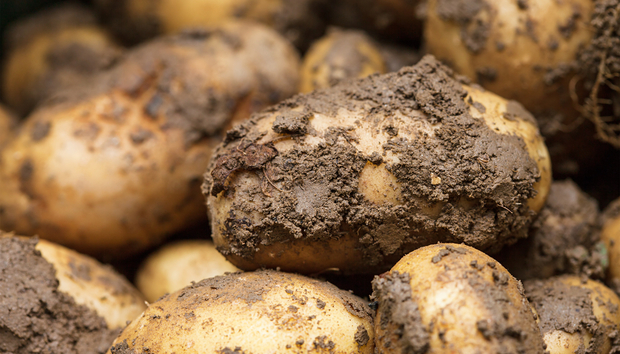 According to a study by S.R.M Janssens in 2013, potatoes are grown in Kenya by approximately 500,000 small scale farmers on 120,000 hectares with an average yield of 7.7 tons per hectare. The majority of these small scale famers (approximately 90%) are said to have less than one hectare. Additionally, 40% of this is spoilt in the process and does not reach the market; while only a small fraction of large market entities – such as potato chip and crisps companies, hotels and restaurants and fast food chains – consume the potatoes that reach the market. “With such a small number of big consumers with stable and obvious demand, an ineffective supply chain and large number of small-scale participants, it makes this value chain particularly ‘ripe’ for intervention,” says Kimiri. The startup also provides a mobile app trading platform through which high value markets such as hotels and food processors can procure raw materials from small scale farmers. The mobile app links agricultural producers with input providers, end markets and logistical services. With SokoShambani in the picture, the small-scale farmers, buyers and consumers are empowered through a more accommodating seller-buyer mechanism that weeds out unnecessary entities like the brokers. “In the market, it is the brokers who do little yet benefit a lot. With SokoShambani, both parties benefit as the farmers are able to sell at a higher price than what many presently get from brokers, while the buyers are also able to buy at a cost lower than the broker’s price,” explains Kimiri. The lack of means of transport and the intricacies involved in getting the produce to the city provided the biggest hurdle for the farmers. While brokers take advantage of this because they can hire or even own the lorries. “We talked to various transporters with empty lorries in western Kenya, and coordinate the collection points along the highway to ensure the goods are delivered,” says Kimiri. With 127 potato farming groups using the system – that includes more than 2000 farmers, and more than 80 potato processors and hotels in Nairobi – Kimiri is confident that the startup is moving to the right direction. Through USAID support using its Financial Inclusion for Rural Microenterprises (FIRM) project, along with the Kenya Government and other players, the startup has been able to form financial partnerships with local banks. This is definitely a step in the right direction as SokoShambani has provided an excellent model through which rural folks can reap the benefits of their agricultural ventures.